This recipe for Kosher Sephardic Poached Fish in Pepper Sauce is from Paula Shoyer's "The New Passover Menu". "This recipe from Limor Decter is versatile and can be made with any type of white fish or salmon. You can really kick up the spice factor by adding a tablespoon of store-bought harissa sauce or some more chili powder, hot paprika, or red pepper flakes if you like. This dish also can be served as a main course for lunch over the Passover holiday," Shoyer says. There are two more recipes from the book that are delicious, including the Kosher lamb stew with apricots, pears and mint recipe and the Kosher gluten-free pistachio and strawberry roll recipe. Cut the fish into 2x5-inch long pieces or fillets may be cut lengthwise in half. Set aside. Heat the oil in a large frying pan with 2-inch sides over medium-low heat. Add the garlic and onions and cook for 5 minutes. Add the red, orange, and yellow peppers and cook for another 4 minutes. Stir in the paprika, salt, and black pepper to taste. Stir in the chili powder or heat of choice. Add the water, increase the heat to medium-high, and bring to a boil. 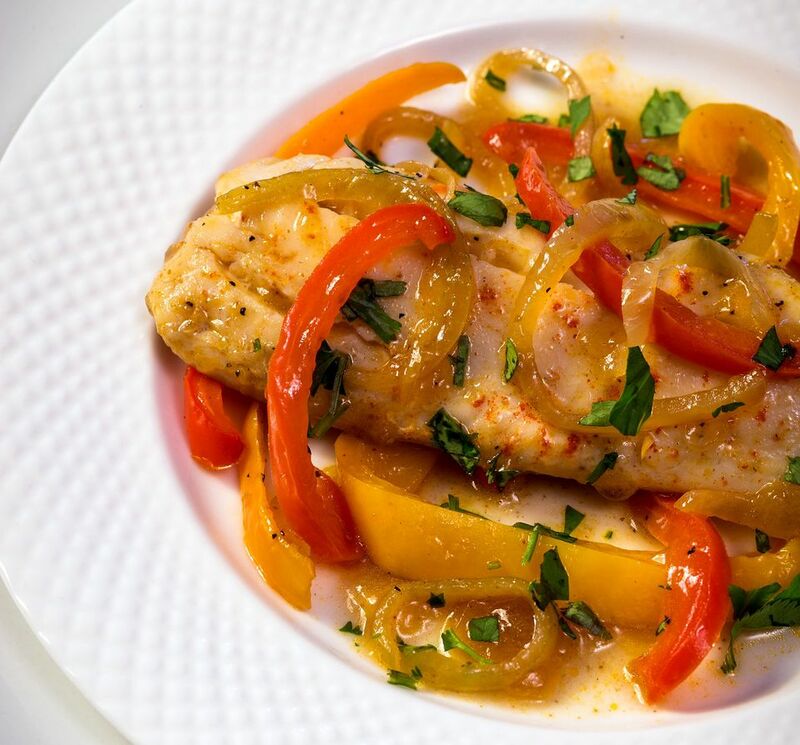 Reduce the heat to low, place the fish slices on top of the garlic, onions, and peppers, cover, and cook for 5 minutes. Use a fork to pick up some of the peppers and onions and place them on top of the fish slices. Cover and cook for another 5 minutes. Taste the sauce and add more salt if necessary. Sprinkle with the cilantro and serve. Serve warm or at room temperature.